The thought of a marrow isn’t something we usually get overexcited about- a big old- sometimes flavourless- watery- marrow, it doesn’t always inspire culinary delight or creativity. People have mentioned how fantastic they are to stuff with stews and then top with cheese and gremolata and place in a hot oven- we are still not convinced. But when it comes to its junior/its baby- the place in which its journey started- the delectable and never-failing courgette- this is when we feel motivated to get cooking. All the different ways in which to prepare them- they are one of the most versatile, easy and delicious of vegetables. Courgettes, along with mushrooms, are always a happy find in the fridge- we like them slow cooked with plenty of garlic, dried chilli, cream and tarragon mixed into pasta mid week, or into a limey prawn curry, or sliced lengthways and placed onto a to grilldle pan and then tossed into a salad with chicken, parmesan and toasted pine nuts, we also love them raw and marinated. With the end of the summer glut- we found ourselves inedited with the most amazing abundance of courgettes from the garden, harvesting them before they turn into the dreaded marrow. Devouring them simply has been complete bliss- steamed, doused in olive oil and plenty of seasoning – but finding new and different ways to use them up has been a fun challenge. This is a recipe made up one afternoon this summer on holiday in France, with a basket filled of courgettes and not wanting to just slice them and throw them on the bbq like most nights- so we got thinking about what you want most having that first glass of cold wine come the evening- something usually sizzling hot, crispy, cheesy, light and with a good sauce for dunking. 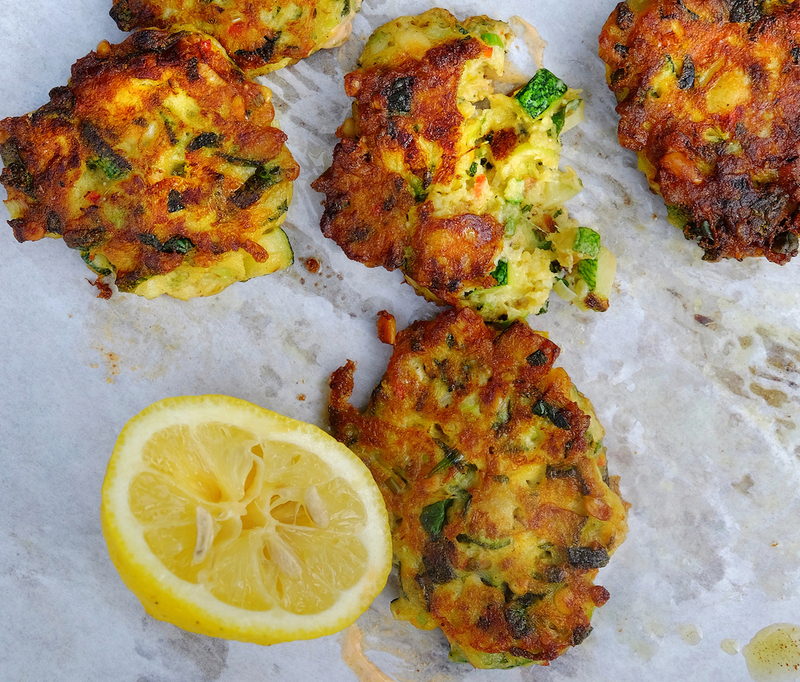 These courgette fritters hit that spot- specially with the added kick from the chilli. Serve them up straight from the pan, onto a tray lined with kitchen paper, with a good squeeze of lemon, seasoning and a bowl of this harissa yoghurt. There are some things worth frying the unhealthy way- crispy excitement that goes hand in hand with a very good glass of white buttery chardonnay.